A lower cost version of Pascal brings upgraded performance to the budget GPU market. Competition is fierce in the ultra-budget category, but the GTX 1050 Ti proves to be the best sub-$150 card on the market. 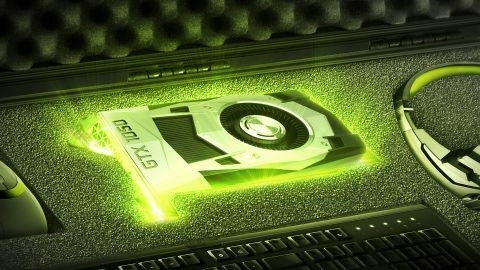 Nvidia is wrapping up their GTX 10-series GPUs with the GTX 1050 Ti and GTX 1050, which will likely be the last GTX 10-series GPUs until next year's GTX 1080 Ti (or whatever that ends up being called). I put both cards through their paces, and while you can read the GTX 1050 review elsewhere, for this piece, the focus is on the GTX 1050 Ti. The GTX 1050 Ti and 1050 are based on a new GPU from Nvidia, the GP107. Unlike the GP100, GP102, GP104, and GP106 that have already seen light of day, the GP107 is manufactured on Samsung's 14nm FinFET process—all the other Pascal GPUs are currently using TSMC's 16nm FinFET process. I wouldn't get too caught up on the difference in process size, since TSMC and Samsung have their own ways of doing things. What's interesting is that the GP107 chips for now at least are targeting lower clockspeeds than the previous Pascal chips, to the tune of around 200MHz off the base and boost clocks. Is that because of Samsung's 14nm process, or simply a case of Nvidia intentionally shooting a bit low to stay within the desired power target? It's tough to say for certain, but it might be a bit of each. I don't anticipate seeing anything lower on the Pascal spectrum in the immediate future—Nvidia seems content to have all the 10-series as GTX models for now, so there are no GeForce 1040/1030 or whatever cards. Maybe those will come with time, or more likely Nvidia is ready to leave the low-performance market to their existing 900-series parts, and let those fight it out with integrated graphics solutions that in many cases aren't able to do much more than light gaming. I think it's also telling that where Nvidia had five GTX 900 cards (not counting Titan X), they already have six 10-series parts (again, not counting Titan X), with a 1080 Ti presumably launching in January. Basically, Nvidia added two more models at the low end, except instead of just changing the amount of VRAM, they're also changing clockspeeds and core counts. The new parts are clearly going to slot in below the GTX 1060 3GB, with an appropriately lower price tag, and in effect they replace the existing GTX 950 and 960 with lower power parts that cost about 30 percent less. What about performance, though? I'll get to that shortly, but based purely on the specs, I wouldn't expect too much to change from the 960 and 950. Both 900-series parts have more CUDA cores than the 1050 replacements, and while the new cards are clocked higher, that mostly makes them equal rather than significantly faster than their predecessors. Here's an overview of the Nvidia sub-$200 budget landscape, with the old Maxwell and new Pascal parts. Paper specifications aren't everything, but given the similarities between Pascal and Maxwell, the major advantages for the new 1050 parts are power requirements, die size, and price. Die size is mostly an advantage for the manufacturer—notice that the GP107 is 40 percent smaller than the GM206, for example. That means on a 300mm^2 wafer Samsung could potentially get around 435 GP107 chips, whereas GM206 would get around 250 chips. Factor in a constant defect rate and yields for GP107 might be close to twice as high per wafer as GM206. The smaller size and potentially improved yields are passed along to the consumer, though, which is a big part of why the new graphics cards are priced so attractively. Where things get a little murky is when you factor in architectural improvements from Pascal. The biggest addition in a card like the 1050 Ti is improved delta color compression, which Nvidia has previously claimed reduces memory bandwidth load by around 30 percent. That means while the 960 is in theory faster based on raw computational power, the 1050 Ti may take the lead in situations where improved memory bandwidth comes into play. Perhaps just as important, however, is that the 1050 Ti costs $40 less than the 960 4GB, and it's launching at a price roughly $80 lower than the 960 4GB. I'm also happy that Nvidia isn't making a 2GB 1050 Ti, leaving that to the ultra-budget GTX 1050. We normally shoot for around $750 in our best budget PC, but if you're willing to give up a bit of performance you can drop to the GTX 1050 Ti and get the price down to $600. What's exciting is that, using the GTX 1050 Ti, you can build a legitimate budget gaming PC for under $500—see the above parts list as one example. Or if you already have a PC but just need a graphics card, for less than half the price of a gaming console you can get a reasonably capable GPU. Just don't expect a $140 GPU to compete directly with the $200 GTX 1060 3GB and you'll be fine. But that's something we do need to consider—how much more performance can you get by moving up to a more capable GPU? To answer that question, let's hit the benchmarks. I've revamped our gaming test suite to include a bunch of newer releases, and I've ditched some older games, making the benchmarks more relevant. All of the cards are tested on their 'best' API, which means unless there's a specific reason to prefer Vulkan or DX12 over OpenGL or DX11, most games run best with DX11/OpenGL on the 1050 Ti. Of the games tested, only Ashes of the Singularity, Hitman, and Gears of War 4 are tested in DX12 mode on all cards—Gears of course being DX12-exclusive, and the other two because they generally run better in DX12 mode. Since the GTX 1050 Ti is a budget card, I'm limiting testing to 1080p at medium and ultra quality, with 1440p ultra results showing whether there's room for the card to reach higher in some games. I'm skipping 4K testing entirely, as that's obviously not the target of budget offerings. I'm using a decidedly non-budget test system, with an overclocked Core i7-5930K, but in most of the games that's not a major factor. I've spot-checked performance with a simulated i3-4360 (dual-core, 3.7GHz) and found most games are completely GPU limited with the GTX 1050 Ti and 1050. The primary competition for the 1050 Ti is a bit nebulous, as the RX 460 4GB costs $20 less while the RX 470 4GB costs $30 more, leaving the 1050 Ti stuck in the middle. I've included those cards, as well as some older GPUs and some cards that are a step up for comparison. The GTX 1050 Ti stakes a claim to the fastest $140-ish budget GPU on the market, easily beating the RX 460 4GB—though that card does cost a bit less. It's not even a close matchup, really—RX 460's best games in our suite are Hitman and Deus Ex, where the 1050 Ti is still around 10 percent faster in most cases, though the 460 does pull off a tie in DXMD at 1080p medium. Elsewhere, Nvidia's advantage can be huge, like the 40-50 percent lead in Civ6, 35-40 percent in Fallout 4, and as much as 70 percent in GTA5 (not that either card really handles 1080p ultra very well there). Even in normally AMD-centric games like Ashes and Doom, the 1050 Ti holds a 25-30 percent lead over the RX 460 4GB. Looking at some older cards, things get a bit messier. Remember the GTX 960 4GB from last year? It delivers virtually identical performance to the GTX 1050 Ti—yes, while using more power, but otherwise they're the same level of performance. If you have something like a GTX 960 or R9 380, there's absolutely no reason to look at the 1050 Ti, but what about budget gamers running something older, like a 750 Ti? In that case, while I haven't collected numbers myself, AnandTech and other sites show the 950 outperforming the 750 Ti by around 35 percent on average, and by my numbers the 1050 Ti is around 20 percent faster than the 950. Together, that makes the GTX 1050 Ti about 60 percent faster than the 750 Ti, a little more than two and a half years later. That's not really giving the GP107 proper credit, though, because while it's not faster it's more efficient and costs less. If you didn't upgrade to the 950 and 960 last year but you were eyeing the level of performance they provide—for esports or for less demanding gaming—the 1050 Ti is a great little card. What more, because nearly all the 1050 Ti models come sans power connector, you can use them in just about any PC made in the past five years. But there's still the matter of pricing. And there's the real issue the GTX 1050 Ti faces. It reaches 60 fps at high or better quality at 1080p in nearly any currently available game. But in terms of strict overall value, the RX 470 and GTX 1060 3GB are better bargains, and they'll provide a more enjoyable gaming experience as they're less likely to stutter during gaming sessions. The GTX 1050 also ranks above the 1050 Ti, which illustrates one of the issues with just looking at this 'relative value' chart, because in practice I'd take the 1050 Ti over the 1050. Overclocking is possible, of course, and with EVGA Precision X 16 I was able to add another 150MHz to the core clocks, while the GDDR5 proved capable of +350MHz and more. Combined with increased power and thermal targets, along with higher fan speeds, that pushed the GTX 1050 Ti performance up about 10 percent. But you can do the same with other GPUs (except my RX 460, which seems to be a little temperamental), and without an external power connector it seems the maximum clocks on the 1050 Ti may be a bit limited. Personally, I find GTX 1050 Ti is more interesting as a near-silent gaming solution, and most of the cards come with modest factory overclocks. If you have a hard limit on pricing of $150 / £150, the GTX 1050 Ti arguably rates as the best graphics card in the budget category. I'd place it above the GTX 1050, simply by virtue of the fact that I think 2GB VRAM on the 1050 will create some problems. I've seen issues with a few newer releases (Doom at ultra settings for example), and with the next-gen consoles including more memory, games are quickly moving beyond running comfortably in 2GB VRAM. If you can spend just a bit more money, the RX 470 4GB is the card I'd shoot for as a minimum level of performance for gaming.